Prototype: German Railroad, Inc. (DB AG) cab control car, 2nd class with a baggage area (type Bnrdzf 463). "Silberling / Silver Coin" design in the "traffic red" commuter paint scheme. Modernized "Karlsruhe" end without the baggage area but with a bicycle compartment. Car no. 50 80 82-34 042-5. Model: The minimum radius for operation is 360 mm / 14-3/16. The underbody is specific to the type of car. The trucks come with disk shoes. The triple headlights / dual red marker lights change over with the direction of travel in analog and digital operation. The headlights are maintenance-free, warm white LEDs; the marker lights are maintenance-free LEDs. The car has a trailing switch. The car is ready for installation of the 7319 current conducting couplings or the 72020/72021 current conducting couplers, the 73406 pickup shoe, and the 73400/73401 lighting kit (2 per car). Length over the buffers 28.2 cm / 11-1/8. DC wheel set 4 x 700580. When operated control car first, triple headlights shine. When operated control car last, a red marker light shines. The typical Era V DB AG push/pull train consists of a 43811 car, several 43801 cars, and a 43830 cab control car. The Silberlinge / Silver Coins cars in the Era V commuter service paint scheme are available with different car numbers in the Trix H0 assortment under item nos. 23431, 23432, and 23433. The ideal push/pull locomotive is the class 141 (item no. 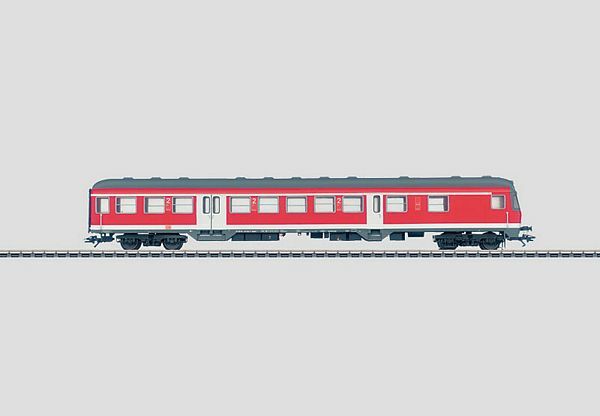 39041 for Marklin).